Leading Manufacturer of cement feeding system and cement feeding pump from Ahmedabad. We are manufacturer and supplier of manual cement feeding system which is generally used for convey cement from bulker to silo and unload cement from bags to silo. In these system bulker and cement bag both can be unload to cement silo. You have to make the arrangement to dump the CEMENT / FLY ASH in the powder form in to the feed hopper. The feed hopper will have a screw at the bottom which will continuously pump the material into the convey line. Convey line is connected with high capacity blower to generate the sufficient force to convey the material into the storage silo. The system will have a facility to convey the loose fly ash which comes into the bulker. Our pre-engineered screw pump and its components are ready for installation and require minimum attention for startup.CEMENT / FLY ASH will be transferred inside the tubing without any obstruction to the Silo. The system proposed herein is totally enclosed and sealed. Adaptor and 10.0 Mtr. Hose for further connection of pumping the material is supply from our scope. We are manufacturer and supplier of manual cement feeding system which is generally used for convey cement from bulker to silo and unload cement from bags to silo. in these system bulker and cement bag both can be unload to cement silo. 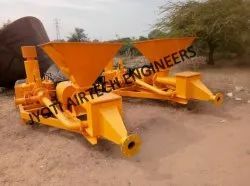 JYOTI make Cement Feeding Systems are constructed of mild and structural steel, and mounted on a base. feeding pumps are equipped with pedestal blocks that support a pump screw which helps to provide a smooth, balanced operation. The screw is dynamically balanced and areas of this screw, along with other parts of the pump in direct contact with the material to be conveyed, are made of hardened, wear-resistant material and special hard surfacing where required. The screw is directly coupled to the driving motor but can be v-belt driven. Standard equipment on fedding pumps includes a pressurized seal and bearing assembly that extends the service life of the discharge seals by preventing the material being handled from entering the bearing area. Each pump system includes the pump, drive motor and compressed air source. It is the most versatile and speedy method of transferring bulk material from one point to another within a defined area. Looking for “Cement Feeding System”?